These came with a lightly used bike that I purchased but I have my own pedals. Looks like they have seen some usage but the bearings are smooth. Asking price is $40 CAD plus shipping. Please add $1.50 if paying with PayPal. For sale is a very lightly used Transition Sentinel with SRAM/Spank build kit. High wear items like the grips and tires are hardly even worn. Transition Sentinel alloy frame size large Fox DPX2 Performance Elite 140mm shock (low hours) Fox Float 36 Performance Series 160mm fork (low hours) SRAM X01 Eagle 12-speed rear derailleur and shifter (lightly used) SRAM GX Eagle cranks and cassette (like new) SRAM Guide R brakes (200mm/180mm rotors) Spank Oozy 760mm handlebars and 50mm stem Spank Oozy Trail 345 rims on Stan’s Neo hubs (like new) Maxxis Minion DHF 3C 2.5 WT front/DHR II 3C 2.4 WT rear tire (set up tubeless) Race Face Aeffect 150mm dropper post In typical Transition fashion it has some rock chipping in the paint around the rear wheel and bottom bracket areas. Aside from that the frame and the rest of the build kit are in showroom condition. Suspension is plush, shifting is dialed, brakes are firm, and the dropper post has a new cable installed. Asking price is $4250 shipped within Canada. Local buyers welcome. Message me for a cash purchase price. For sale are a SRAM GX Eagle derailleur and shifter. Barely used before upgrading to X01. Virtually no scratches or wear on the pulley wheels. Included is an unused SRAM MMX right clamp to seamlessly integrate SRAM brakes for a clean cockpit. Asking price is $190 CAD plus shipping. Please add $6.00 if paying with PayPal. 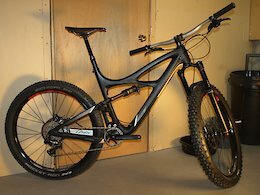 For sale is a medium 2014 Pivot Mach 429C with full carbon frame and swingarm. It is mechanic owned and very well taken care of. Condition is excellent especially for a bike that’s a few years old. Upgrades include: Pike RC fork, Reverb dropper, and Chris King headset. 2014 Pivot Mach 429C frame 100mm travel size medium Fox Float Factory CTD Boost Valve shock RockShox Pike RC 130mm fork (new this year) RockShox Reverb 125mm dropper post (new last year) Full Shimano XT 2x10-speed drivetrain (24/38Tx11-36T) w/ XTR RD (new chain this year) Shimano XT M785 brakes (180/160mm rotors, new pads just installed) Hand built White Industries XMR/Stan’s Arch MK3 wheelset (used for less than 100km, as good as new) Schwalbe Hans Dampf EVO 2.35” front/Nobby Nic EVO 2.25” rear tire (same as above) Parts have been replaced/upgraded over time as necessary. Dropper post, cranks, chainrings, brake rotors, handlebars and grips were all new last year. Full overhaul of front and rear gearing just performed. Rear brake bled and hydraulic system flushed with fresh fluid. Asking price is $2265 plus shipping. Canadian buyers only please. Local buyers welcome. Brand new take off from Giant XTC+ Adv. Was setup tubeless so small amount of residual sealant. Evolution series, Trailstar compound, Tubeless easy. Asking price is $50 CAD plus shipping. Please add $1.75 if paying with PayPal. Excellent condition. 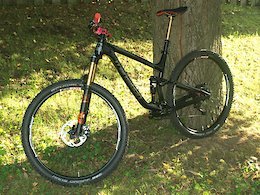 Taken off a Giant Trance X 29er. Stem is 90mm in length and 8 degrees in rise. Please note: only fits forks with a 1 1/4" upper steer tube such as those with Giant Overdrive 2. Asking price is $15 CAD plus shipping. Local pickup preferred. 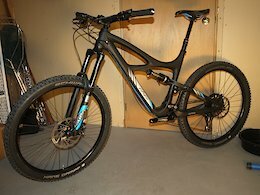 Installed on an Ibis Mojo HD3 but never used as build plans changed. Looks good as new aside from some Park Tool grease on the threads. Asking price is $35 CAD plus shipping. Please add $1.25 if paying with PayPal. Standard volume 7.875" x 2.25" (200 x 57mm) Monarch air can. Taken off a Kona Process 153 DL. Low hours before swapping out for a high volume air can. Asking price of $50 CAD plus shipping. Please add $1.50 if paying with PayPal. Used for less than 100km on a back up set of wheels before upgrading to 11-speed. Asking price of $30 CAD plus shipping. Please add $1.25 if paying with PayPal. Post is in excellent condition, a few scratches below insertion point, not a mark above. Taken off a Pivot Mach 429C when I installed a dropper. Measures 30.9mm in diameter, and 367mm in length (uncut). Weighs in at 245.4 grams. Asking price of $65 CAD plus shipping. Please add $2.00 if paying with PayPal.